Yesterday, I have to say, was kind of a crappy day. 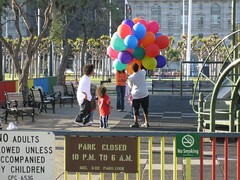 But after work on the way to the BART, I saw a man walking across the square between the city hall and the library with this big bunch of balloons. And he handed them over the fence to this guy in the playground and walked off. It’s hard to see here, but this guy was dividing them up for the kids who were playing. It was a nice thing to see. For those of you who are keeping score, we did indeed have another 3 a.m. visitor night before last. 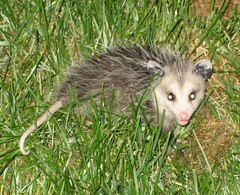 ‘Possum #3 was also released unharmed, although spitty from Tex’s attentions. I had thought a bit over the weekend about how to deal with additional ‘possums and had a plan — I hung on to the dogs and told K. just to grab the broom and dustpan and sweep the little guy up and out the door. It seemed like a great idea, but it was harder than you’d imagine — even when they play dead, they can hang on to the carpet with their claws. Still, it was eventually successful. We also have now figured out that they’re coming in through the wall furnace, and that will be blocked off next week. So maybe we’re nearing the end of our ‘possum experience. Maybe. K.’s mom was in town last weekend, and every minute was packed. We did all sorts of excellent stuff. This weekend K. was out of town, so I was left to my own devices. I did the sort of thing I do every time I’m left alone — stay up too late, sing along to the radio, eat strange meals at odd times of day, watch old TV shows and take a lot of walks. 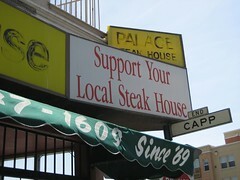 I had really planned to take the opportunity to visit the Palace Family Steak House, which is just a few blocks from our place and has an unauthorized musical written about it. K. and I are both sort of fascinated with it, but who knows if there’s any chicken on the menu that she could eat? I had planned to do some reconnaissance the next time she was out of the city. However … I’ve had a bit of tummy trouble recently, which I blame on my gallbladder (or lack thereof), and I recently found out my cholesterol is a tad high as well, so eating at a mediocre steak house seemed like a not-so-wise choice for this weekend. Instead, I did the opposite, and ate no meat at all. My splash-out meal was a vegan Indian pizza and a Kingfisher from Zante’s ordered for delivery. In fact, I think I’ll go finish that pizza right now. This morning about 4, Haylee started up barking again, and K. got up and went into the kitchen to find Haylee steadily woofing and Tex standing there with yet another ‘possum in his mouth. He tucked it into his bed and laid down beside it while we ran around trying to figure out the best method to use to remove it; but then it gave up on playing dead, and took off running through the house. After much chaos, this ‘possum eventually “dropped dead” again, and was captured in a brown paper bag. It was then released in a location that shall remain undisclosed, in order to protect all parties. This one, however, had its picture taken. In case you’re wondering, opossums have eight to 10 young per litter. So, you know, this should only happen six to eight more times. 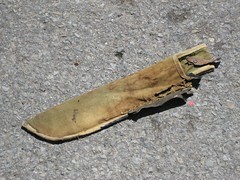 So, today at about 3 p.m. my landlord sent me an e-mail and told me the dogs had been barking all day. I don’t like that kind of e-mail — I’m nervous about the barking, because Haylee is big on barking, she likes to do it. And I don’t want my neighbors to be upset with me because I can’t get her to shut up. But the note said that, in fact, the dogs were usually quiet all day, and all this barking was unusual. I told him that maybe one of them wasn’t feeling well, that I’d check them out when I got home, and I was really sorry that they were barking. About half an hour later I got another e-mail from him. He asked me if they were supposed to be in the living room — they weren’t, I had left them barricaded in the kitchen. He also said both of them were barking, and Tex doesn’t bark unless something is actually going wrong. I told him that I guessed maybe they’d managed to get out of the kitchen and then couldn’t get back in, and that was getting them upset. But I really didn’t know. It made me anxious to think about the dogs suddenly starting to bark for no reason and driving my landlord nuts, so I hurried home. When I came in, Haylee was still in the kitchen, barking her head off. Tex was just acting nuts. I walked around the house and surveyed the damage. They’d rolled all over the new couch, and it was really hairy. And they’d drug a bag of Kyre’s across the floor. Getting on the couch wasn’t a surprise, but the bag thing was. They don’t usually get into our stuff. Tex was still going crazy, running in and out of the living room, freaking out. Then I saw the problem — there was a ‘possum in the house, laying on the floor in the middle of the living room. It was small, not a big adult, and bedragged, and looked dead … but, of course, that’s what ‘possums do, right? So I barricaded the dogs out of the living room again, and … then I didn’t know what to do, now that I’m an apartment dweller and no longer living in a house with a full cadre of shovels and other tools one could use to remove a dead animal from one’s living room. So I went and got my landlord. He did have a shovel, and he went to get it. But by the time we got back to the apartment, the ‘possum was gone again (not dead, apparently). I had been afraid this would happen, having been tricked by ‘possums in the past. Some people never learn. So we start dragging furniture around the apartment, trying to uncover the ‘possum, which we now know is alive and could be anywhere. After searching for about 15 minutes, I suddenly remembered that I was the owner of two hound dogs. I put the dogs on their leashes and returned to the scene of the crime. Tex walked straight over to a shelf, knocked over a book, and then backed away from the ‘possum, who was once again playing dead. Ah, now the story turns grim. My landlord whacked the ‘possum with the shovel, and then scooped him up and put him in a paper bag. Was he dead? I didn’t take his pulse, but I doubt it. It’s still unclear how the ‘possum got in the house, and figuring that out is a project I’ll leave for the weekend. When I told K. this story, she said, “Did you take a picture of it?” No, I didn’t. You’ll have to use your imagination for that.